A misting system cools the air around the AC condensing unit with a super fine mist. This mist evaporates instantly, significantly cooling the ambient air temperature around the unit. This allows the condenser coils to transfer heat much more efficiently. A medium pressure, low amp booster pump with built-in proprietary electrical control system, senses condenser activation through a low voltage relay sensor and releases just enough treated water to atomizer nozzles located below the condenser. 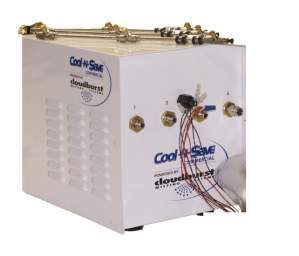 This cools the surrounding air by as much as 30 degrees thereby reducing compressor head pressure. How are Misting Systems installed? Arrays of customized misting arms and nozzles are designed by our engineering staff to meet the specific equipment specifications and environmental conditions for each sight. 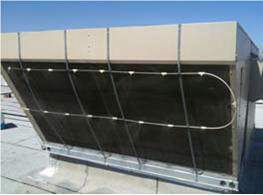 They safely attach to the outside of the condenser coils without damaging the coils themselves or restricting airflow. Once installed, each nozzle is positioned and field calibrated to produce the best mist pattern for optimal performance. 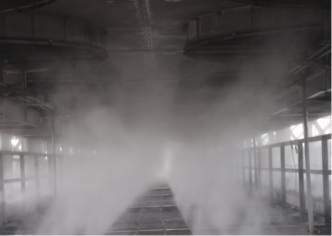 What are the benefits of Misting Systems? The primary benefit of misting systems is reduced equipment operating expenses. This is principally achieved by reducing compressor head pressure and therefore compressor amperage. 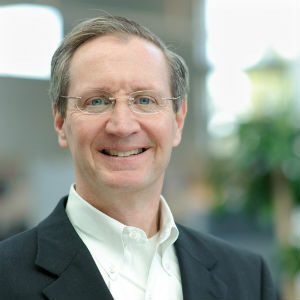 In addition, since “on cycle” times are reduced equipment life is extended and replacement costs are reduced as well. Will Misting Systems harm my condenser coils? In a word, No. Choosing the correct scale reduction or elimination product is an important part of creating the best pre-cooling system for your needs and conditions. Our systems are designed to include the correct treatment products that will eliminate scale build-up on your condenser coils.